Since the day I arrived in California, I’ve been getting more and more tan. This is very puzzling, considering I haven’t even been trying. Back when vanity had full reign in my life (even though I was young, thin, and cute), I always regretted my pale red-head-type complexion. Every now and then I would attempt the boring art of sunbathing, which consistently resulted in sun burning, peeling, and freckled skin. In Mexico I cautiously avoid the sun at peak hours, and still occasionally burn if I hang too much laundry too late in the morning. So you can see why it surprised me to inexplicably turn brown by merely going for a late afternoon or early morning swim. It became almost a joke, as I would ponder what on earth had caused this strange phenomenon. 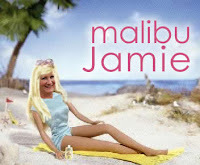 I even suggested to my daughter that maybe Californians spray something in the atmosphere to force the “Malibu Barbie” effect on unsuspecting newcomers so we can blend in. She would humor me, probably rolling her eyes behind my back, but could offer no alternate explanation. Clearly I was growing darker by the day. While in Wisconsin for the wedding (see photo in sidebar), a casual chat with my 1st ddil* revealed the source of my tan. As I was sharing with her some of my latest cheap natural skin care tricks, I mentioned using coconut oil in place of antiperspirant (it really works!) and body creams for my desert dry skin. That’s when she added that her mom uses coconut oil for tanning. Ding-ding-ding! Light bulbs flipped on like in the cartoons. Mystery solved. The irony is that I never could tan when I desperately wanted one, but once I stopped caring about such vain trivialities, voila! Instant California-bronzed arms and legs. It also explains why the only place I have burned is on my back, where I can’t reach with the coconut oil. Here’s another mystery, as yet unsolved. Maybe you can help me with this one. Why is it that we all meticulously study photos to find our own flaws exposed, so focused that we honestly don’t notice other people’s bad hair, double chins, flabby arms, or whatever… and yet when we read certain books and hear convicting sermons, we quickly remember others’ imperfections (sins) and not our own? Admit it. How many times have you read a book only to think, “My coworker So-and-So should read this.”? I guess I am coming full cycle. Caring too much what others think, to not caring at all what others think, to finally caring only as it might help me in my quest to become Christ-like. Snort. I had to giggle at the end * comment. I better go find me some coconut oil...and work at expressing my faith as effortlessly as you get a tan these days. You might also burn instead of tanning in Mexico because you are nearer the equator. If you are in the mountains, as well, so much the more so--oxygen is thinner up there. I had SO MANY major burns as a kid in Guatemala--in the tropics and usually at 6000 feet or so. I had very few in college in CA, where I'd sometimes be at the beach ALL DAY. I do burn some in Utah, at 4500 feet, but not very often, and not nearly as badly as I did years ago.